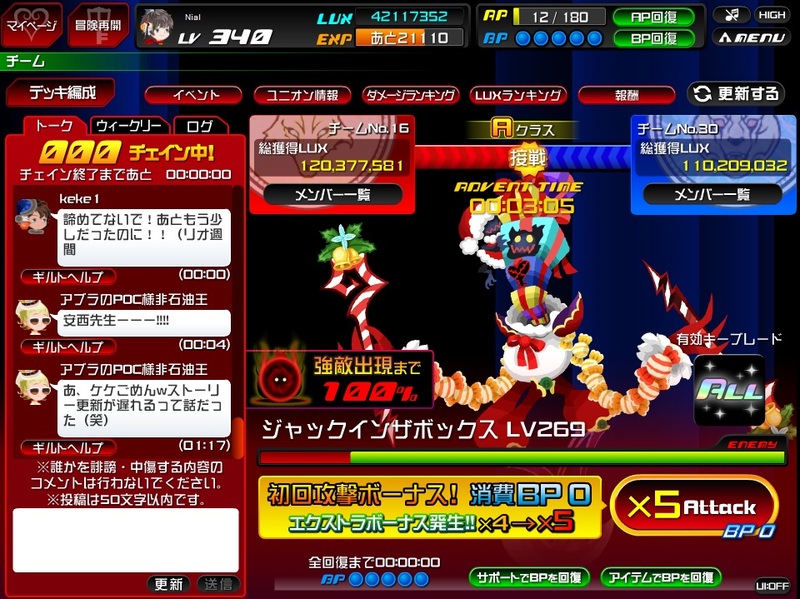 Help/info needed from anyone playing Browser KHX - Any and all Raid Boss Music info. Hi all, new to KHInsider here, hope I'm posting in the appropriate forum (though could also fit in the UX forum). I feel like I can probably get the answers I'm seeking here, because I haven't had much luck from Google or Youtube (but a few people on other forums have been helpful, which leads me here). Anyway, I'm working on a project listing each and every instance of each KH music used and recycled in the series. Have pretty much most of it down for the 7 pre-X games out (as well as the Days/Coded movie differences). So, bottom line here is I've been working on one for KHUX and since I'm avoiding spoilers, I've been updating it as NA has released content. Well, actually, the even-more-bottom line is, I figured I'd also do it for Browser KHX since it's a slightly different game and Nomura said it would "diverge" (though it hasn't really yet) and it has some of its own unique music, and Everglow happens to conveniently have a walkthrough up to do so. I got most of the basic things down (difference in music in tutorial, use of Rowdy Rumble for KHUX targets and Destiny's Force for KHX "exterminations", difference in Gummi menu music... all the scenes with unique music seem to be in both so far). I did get a little help on Reddit's KH section this thread and this follow-up thread. Actually had some unexpected surprises. I knew some of the basic ones like Guard Armor kept their classic "Shrouding Dark Cloud" and Darkside with "Destiny's Force" since they're the signatures of those (and I think I was able to find videos of them). It wasn't until I found the video of the Omega Spider playing Vim and Vigor (not in KHUX at all) that prompted me to ask... and it turns out they're even more drastically different than I thought. But, bottom bottom line (promise this is the last, haha), if anyone here playing KHUX can provide me with as complete a list as possible of all the Raid bosses (even Omegas and Specials) in Browser KHX and the music they use, that'd be great. With what I have so far I definitely heard there were some tracks I'd never have expected like Battleship Bravery (Gummi Hound) or Spooks of Halloween Town (Hocus Pocus). Also even apparently the Corrupted was used for Queen Bee in that (which until now I thought was KH2 exclusive). Definitely would like to somehow get the full list, especially before the game disappears forever in a month. TL;DR - Need a list of KHX Raid bosses and music, anyone able to help? PS If anyone's interested I can post what my list (of all music in KHX/UX) looks like so far. I believe the Trident Anchors used Vim and Vigour, and possibly also the Carp Submarine? The Gummi Hound used Battleship Bravery, a very clever choice and the only time I've seen a gummi tune "cross over" like that. Are you sure? About the Tridents I mean. I was under the impression they had The Encounter like in UX. I'm pretty sure one of the videos I was able to find was of the red one using The Encounter (and I think the normal one as well). I'll post a full list of what I have and what I'm missing when I get home and in front of a computer and try to provide links as well. Hm, well, no, I'm not sure, so trust your other sources. Alright, here's what I have (thanks Nial btw, I didn't have that one ). I'm gonna assume that everything here has showed up in X (except maybe Captain Avaricious?). So yeah... anyone able to help fill in the blanks? Found a video of the Darkside... strange, was expecting it to have Destiny's Force. Also weird that the Trickmaster and Darkside have their Omega forms get Deep End, but the Omega Behemoth and Spider don't. Anyway, anybody know any of the ones I'm missing? Captain Avaricious has appeared in X, (it debuted in X actually). I'm pretty sure this was the track they had, at least in the field/corridors. At least according to the game files the background theme for the Fortress Crab Omega is "The Corrupted". I wish you posted this question two weeks earlier since we're rotating through all Raid Bosses since then. Thanks! I heard it was in the game as a non-Raid boss though? Was actually trying to find a video of the Dark Corridor event but couldn't find any sign of it. That's interesting though, would never have guessed that to be the track, as much sense as it makes. You sure that was it? And... how trustworthy are these files, do they match the list I have so far? We're still rotating, probably till the end of the game, but I don't know if we see all bosses again. For the worlds ag=Agrabah, bc=Beast's Castle, db=Daybreak Town, dg=Dungeon aka Dark Corridor Trials, dw=Dwarf Woodlands, oc=Olympus Coliseum and finally wl=Wonderland. The numbers for the Raid Bosses are: 0001=Darkside, 0002=Darkside Ω, 0003=Behemoth, 0005=Guard Armor, 0009=Trident Tail, 0013=Fortress Crab, 0014=Fortress Crab Ω, 1000=Hocus Pocus, 1010=Purple Gummi Hound. All other Raid Bosses reuse themes first introduced by bosses before them, so there is no way to be sure which one (this information is server-side only) but at least there shouldn't be more of them. Hope this helps, I'll keep my ears open for future bosses. Since I mostly play without sound I don't really know which theme played for Captain Avaricious during the trials. I haven't found "Pirate's Gigue" in the background sound file for this world (where it should be), in Unchained "Fragments of Sorrow" is playing. Alright cool, thanks! Definitely useful information. Question though - Does this mean Pirate's Gigue isn't in the game and the guy may have been mistaken or confused with another track? Or is there a possibility you just weren't able to access it? Also, what is this given order of Raid bosses? Obviously not the order from the Wiki page Gummi/Hocus aren't right after the Behemoth? You seem to know this order (I understand though that the already used music and which specifically it is is only available server side), but what's this cardinal order of Raid bosses? I mean I can probably guess what most of it is in the beginning, but not so much later... you seem to know though. Is this also the order in which they are rotating? Weird, I'm positive it was "Pirate's Gigue" that they used for the Captain Avaricious on the field. But then again my memory is pretty sketchy on it, and I didn't record footage of it. Yeah, I can second that I'm pretty sure it was Pirate's Gigue - it was in my browser history, and I remember having had to double check what the name was via Youtube. Hmm, anyone with any Japanese knowledge possibly able to find a video which may include it? Provided you know what to search for... heh, since you probably have more knowledge on the game than me. I couldn't find any English-titled videos. Also, Shard, I noticed your rip didn't include Vim and Vigor, despite saying there shouldn't be more of them... what's up with that? EDIT: Shard, I actually found Pirate's Gigue in your Rip! It was actually included under "enemy sounds". Along with Fragments of Sorrow and Deep End... I imagine the Darkside and Omega Darkside were in that event as well! I think that mystery is solved and the above two are correct, thanks! Still have a few more to figure out though... also curious about Vim and Vigor. I couldn't find it in a single folder anywhere. Still have a few more to figure out though... also curious about Vim and Vigor. Found it, it seems it was intended for an event Raid Boss that was never released (we've skipped four so far), that's why I didn't look for it. I'm pretty much guessing my way through the file system of this game, so there will always be things I didn't or absolutely can't find. Oh cool, so it's there. Anything else where that came from (in whatever "skipped/never released" folder you found that in)? No, I've checked some more places but that's everything I can come up with at the moment. Enchanted Dominion also has a sound file but it's empty. You should ignore the first number of every file, it's part of the extraction process, I've cropped them and re-uploaded the whole thing. It's the second number in the file that's important. Every world has the field, battle and general story enemy theme (mostly "Destiny Force") while some bosses use specific background themes. 073=Master Ava, 112=Cerberus, 169=Playing Cards (Card Corps), 198=Darkside, 199=Darkside Ω, 219=Trident Tail, 227=Wiley Bandit, 240=Trickmaster, 245=Jack-in-the-box, 261=Crab Fortress, 262=Captain Avaricious indeed and 266=Purple Gummi Hound. Okay cool thanks I'll check it out. Found a video the Green Trident Tail btw (not much of a surprise what it plays). Looks like also Dance to the Death as well. Another one down! Still can't find a video of the Omega Crab... would rather see that (or hear from someone playing it) before adding that as the Corrupted.